I his small lark is usually round on heaths or mountain grassland: its habitat sometimes includes scattered trees on which it often perches. It feeds on the ground, taking seeds and insects. The male sings from a perch or in a long, slow songflight. 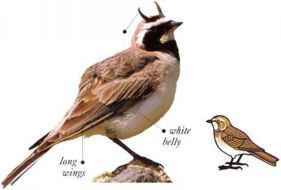 A grassland lark famous for its aerial songlligln, the typical Skylark prefers short grass, upright such as pasture. I.ike all posture larks, it walks, as opposed to hopping. It feeds on plants, seeds, and insects. Outside the breeding season. Skylarks live communally in flocks. • DISTRIBl ITION Grasslands across Eurasia and N. Africa. Northern populations migrate southward in winter. 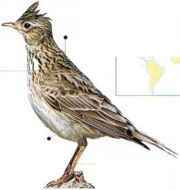 This lark forages vn bare, stony, or cultivated ground for seeds, plants, and insects. Males give a weak, high pitched song in an overhead songflight in spring. Eurasia. N. and S. America. 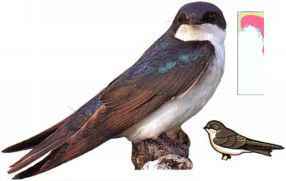 Migrates to south of breeding range (Eurasia), or to north (S. America), or to ocean shores (W. Europe and n. America).